It’s a bit of an understatement to say that you have options when it comes to shopping for Halloween candy. You know kids remember the houses that give out the best candy every year, and you don’t want to disappoint them. While some people pass out standard, humdrum types of candy at Halloween, the trick-or-treaters who knock on your door will appreciate your extra effort to distribute truly scary Halloween-themed candy. Gummies have long been a popular candy. These sugary, mouthwatering chews come in countless fun shapes. This autumn, make your trick-or-treaters happy with an assortment of Halloween gummy candy. You can get packages of creepy gummy bugs, lobsters, and various other creatures. 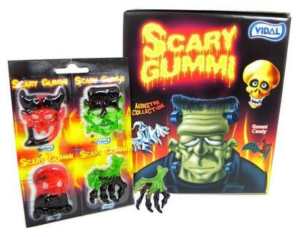 Or get a set of monster gummies, featuring monster heads, hands, and other shapes. Vidal offers an array of scary Halloween gummy candy that is sure to please trick-or-treaters and party guests alike. You can buy packages of Vidal’s multi-colored witch stocking gummy candy or a large bag of gummy brains. If you want more creep-out Halloween gummy candy, Vidal also sells bags of gummy eyeballs and assorted missing body parts. Kids will love finding gummy skulls, brains, bones, teeth, feet, and fingers in their trick-or-treat bags! Another fun option with these is to place a pile of body parts in a bowl to keep around the house so you can munch on the spooky gummies throughout the day. Make the most of the Halloween season this year. Go all out for Halloween gummy candy, and expect the kids to remember you next year! You can order your candy from BlairCandy.com. Did You Know We Have Bulk Wedding Candy? Wedding season is here and you may be planning out your dream wedding and reception. If you’re looking to add a dessert table or a candy buffet, be sure that you look at our bulk wedding candy before going anywhere else. We have a huge variety of classic wedding candy, buffet candy, and retro candy that will make guests smile and your big day even sweeter. Here are three different types of candy that you should check out while planning your candy buffet. Wedding Candy: Classic wedding candy is always welcome on a candy buffet. From pastel mints to Jordan almonds, these candies not only look great but are super delicious. For these, stick with light colors or white, especially when you have a darker color scheme for the table. That way they’ll be an integral part to the table without stealing the limelight from fun novelty candy or pretty desserts. 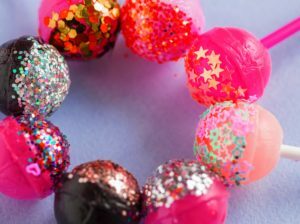 Solid Color Candy: There are so many types of solid colored candy that are perfect for candy buffets, guest takeaways, or as decoration for tables. Choose from chocolate Sixlets, gummy candy, and lollipops to keep your color themes running throughout your reception. Retro Candy: There’s at least one retro candy that will be a perfect addition to your candy buffet. Whether it’s because of the packaging or because the candy just tastes amazing, retro candy pairs wonderfully with other candies. 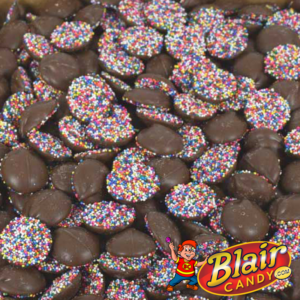 Get inspiration today for your candy buffet or wedding favors by visiting us at BlairCandy.com! You’ll be able to find plenty of products to fit your theme, color scheme, or tastes all on a budget. If your child is having a themed party, you may be wondering how to pull off a candy buffet to match. 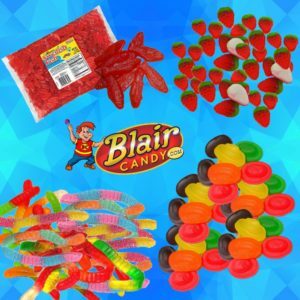 Luckily, Blair Candy has plenty of themed and non-themed candy in bulk to help you create a memorable experience! These are a couple helpful things to help you start building your buffet. Everything doesn’t have to match. Plain colored candy in bulk is your friend. It doesn’t have to be just candy. Baked goods can also be a delicious addition to your candy buffet. We recommend to sticking to smaller items, like mini cupcakes, cookies, and cake pops. Fit them into the theme by using themed plates and by decorating them with the theme’s colors. 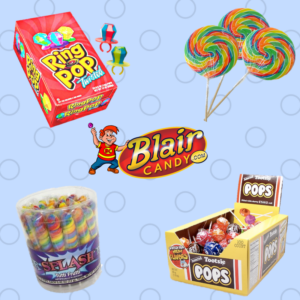 Get started on planning a spectacular candy buffet with the help of BlairCandy.com today! We have a variety of TV, movie, sports-themed candy to make your child’s special day even more special. Planning a Spring Wedding? Let us help! First, if you want to put out a full candy buffet, figure out how many people you plan on inviting. Many sources suggest that you should plan to have enough candy for every guest to take home about a pound and a half of candy. This doesn’t include the big, centerpiece treats such as cupcakes, oversized lollipops, or full sized candy bars. Second, where will your ceremony be held? If you plan on spending the majority of the reception outside, stay away from candies that will melt, like regular chocolates or gummy candy. Instead, plan for Sixlets, lollipops, or the classic Jordan almond. Finally, check out candies in your color scheme. We have plenty of wedding candy by color, so you can find the best candy that will stay within your theme. Don’t forget to add an accent color or two to your candy selection! 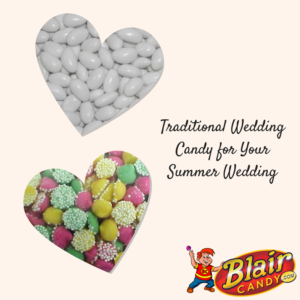 Start looking at wedding candy today at BlairCandy.com! Novelty Candy with your Favorite Characters! Everyone remembers a video or a board game that they loved growing up. These candies take nostalgia to a whole new level. 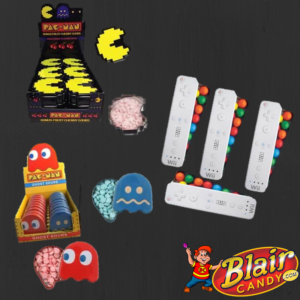 The Rubik’s Cube, Magic 8 Ball, or Nintendo Controller tins filled with either mints of candy are a great way to add a retro vibe to a typical candy surprise. What if you’re looking for a specific character? This may be the case if you’re planning a birthday party centered around you child’s favorite TV character. We have plenty of candies that will add to the magic of a themed birthday. 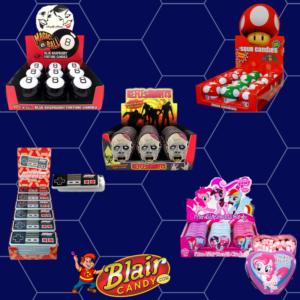 For example, there’s Hello Kitty, Super Mario, My Little Pony, and Star Wars are all super popular in children’s parties right now, so we have a huge selection of themed candies. Finally, what if you need to add to a theme? For instance, Halloween is coming up, so scary themes candies would be perfect to add to the festivities. Try these OUIJA mints or these spooky zombie candies for adding to the haunted candy buffet! There are plenty of novelty characters with well-loved characters, themes, and more at BlairCandy.com! Find these and other candy treats for the perfect party or surprise for someone you love. Summer weddings usually are a little more laid back than the other seasons. However, traditional wedding candy still makes an appearance at these events. While you can really spice things up with a candy buffet, you should make sure you have the following somewhere at the event. Jordan Almonds: These candy coated almonds are a wedding staple. Choose from a variety of colors or go with a simple white color to fill jars at the buffet or add to small bags for a take away treat. Pastel Mints: While the colors don’t appeal to those choosing decorations, these mints are just as soft as they are sweet. Because of this, many overlook the colors and serve them anyway. Melty Mints: These are extremely similar to pastel mints, especially when it comes to the colors. However, they melt a little faster which gives them the difference from pastel mints. 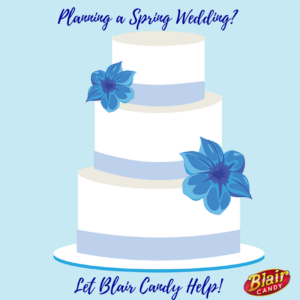 Whether you want to go traditional or a little more modern, Blair Candy has the treats you need for your candy buffet, decorations, or as treats to take away. Color Splash Lollipops are the most versatile. With nine different flavors and colors, you can mix and match these lollipops in bulk to get the best combinations. While you won’t be able to completely pick and choose the colors you need, you’ll get the most flavor from these retro lollipops. These are best for goodie bags, as they are a bit smaller than the other lollipops. Are you basing your theme off of certain character or movie? Find lollipops that have your character on them, have toys attached, or have a crazy flavor to fit the theme. No matter what you theme is, color scheme, or occasion, Blair Candy has the lollipops in bulk to go with it all. Shop all candy now to throw the party of the year! Novelty Candy Perfect for Party Favors! Wacky Monkey Candy – This candy-filled tube is topped with a silly monkey! It’s perfect for parties at the zoo or a jungle themed event. Pez Dispensers – Who doesn’t love a Pez Dispenser? Find the theme of your child’s party, or their favorite characters in bulk boxes. Just add them to the bag and you’re done! Candy Blocks – Kids go crazy for this candy! Every child can have their own box and they’ll have fun playing with it. Gummi Lunch Bag – This super fun snack will make anyone smile. It’s packed with plenty of gummy goodies for kids to share when they leave the party or keep for themselves. This is just the beginning of the fun. 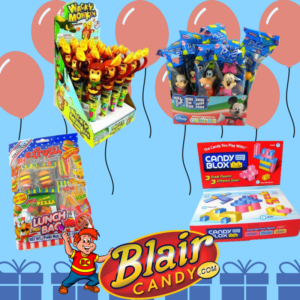 Check out Blair Candy’s huge selection of novelty candy that is ready to party! Shop now to start choosing the perfect party favor.